Due to high vehicle and trailer GVWs, the transmission's internal parking pawl is not utilized. 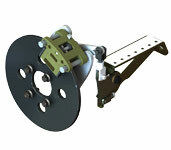 Instead, parking brakes have been incorporated into the rear wheels or differential input. 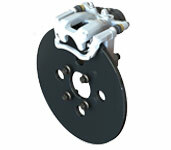 With our drum and disc parking brake options we can accommodate common driveshaft lengths, common cable inputs, existing transmission crossmembers, driveshaft upgrades, and modernized brake-apply systems all with an improved factor of safety designed specif cally for GSE vehicles of all sizes. 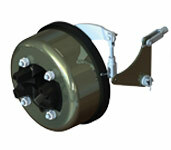 This kit is a direct drop in replacement for the Ford C6 Drum Brake kit. A complete package requires both the transmission (extension housing included) and this kit (with drum housing, yoke, and drum brake components). Contact PCS for kit options without the drum. Our new extension housing (FFO) has undergone extensive development and testing to improve the maintainability, driveshaft angle, and longevity of the driveline. Utilizing a four bolt f ange driveshaft interface our output is 4.2" shorter than previous C6 designs. 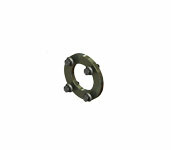 This spacer is available for any transmission where the mounted parking brake is not necessary. Using a MICO® mechanical caliper and an easily adjustable linkage, this transmission mounted driveshaft parking brake is capable of 2100 N*m of driveshaft holding torque before differential reduction and tire size. Capable of being commanded or automatically applied, this electronically controlled caliper guarantees a safe working environment for any operator, technician, and equipment nearby. This unit is fully programmable to acknowledge any desired inputs such as Engine-Off or Parking-Brake-Switch-Applied.